If you need to configure exim4 on a web-server to route outgoing mail but do not want the web server to perform local delivery of e-mail addressed to your own domain name, the simplest way is to configure a “hubbed host” for your local domain. This will route all e-mails to your local domain through an external mail exchanger, and disable local delivery of e-mail to your own domain. And avoids the dreadful “Unrouteable address” error message. Great news for all users of the very popular (70,000 downloads) legacy plugin for WordPress “YD Recent Posts Widgets with Thumbnails” that I developped in 2009 and maintained up to ca. 2011. 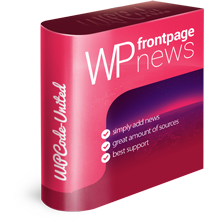 This plugin now has an official, brand new successor known as “WP Frontpage News“. Ever since WordPress 3.0 was released, the TwentyTen theme bundled with the distribution has included a feature do dynamically manage the content and organization of menu items from inside the WordPress administration interface. Here’s a step-by-step guide to integrate that feature to any existing WP theme. When file permissions are not setup the way it expects, WordPress cannot use the automatic upgrade feature and prompts you for FTP or SFTP credentials to perform any upgrade on a theme, plugin or the core WP files. This happens even when WordPress does have actual write permissions on the files that need to be upgraded.